A few weeks ago my son brought home the beginnings of his tomboy stitch (or French knitting as I found out via commenters below). For those who have never heard of it, it’s a crude form of knitting that’s been around for at least as long as my father (and probably longer). It’s been great at keeping him occupied both at home and at school. 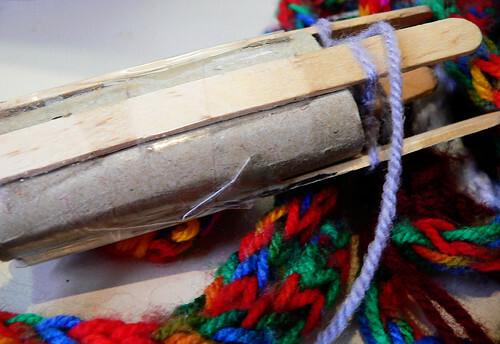 When I used to do it at my son’s age we used empty wooden cotton reels but they aren’t easy to come by any more so an empty toilet roll and four wooden icecream sticks will suffice. As the image above shows, evenly space the four wooden icecream sticks around the outside of the empty toilet roll and sticky tape them on. Note that on one end the sticks go past the edge of the cardboard toilet roll. This is what’s used to do the tomboy stitch. I wasn’t around when JJ started his tomboy stitch but I reckon this will work. Loop some wool around one of the icrecream sticks and tie a knot. Loop the wool around again and pull the first loop over the second loop, therefore creating the first stitch. 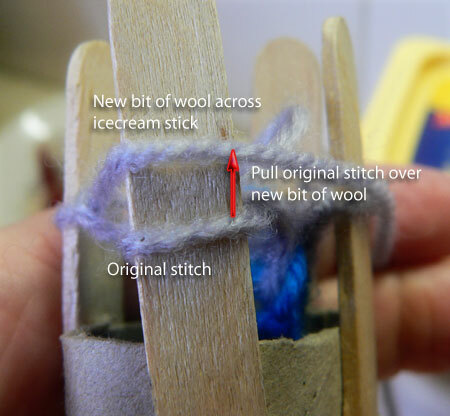 Move onto the next icecream stick holder and loop the wool around twice and pull the first loop over the second loop again. Repeat this twice more until you’re back to where you started. This will create the base of the tomboy stitch. Keep going in an anti-clockwise direction if you’re right handed. I’m presuming a left handed person will go the opposite way. 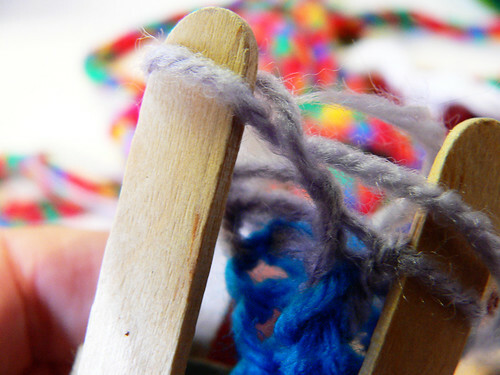 Pull the wool across the stick like the image below so the existing stitch is underneath. Then pull the existing loop over the piece of wool as I’ve tried to demonstrate below. Keep repeating this around and around the four sticks until you get completely sick of it. It’s very repetitive but fun to do because it can get really long and kids love a competition. There’s a competition going at after school care to see who’s got the longest tomboy stitch by the end of this term. If anyone’s got any questions or comments about this method please let me know.